Our home environment, the Gulf of Bothnia, is known for its storms and choppy waves. That’s why Sargo boats are built for all kinds of weather. The Ostrobothnian boat builders learned their craft in tough Arctic conditions. Every Sargo is a true all-season boat whose speed, handling and ride can take you safely beyond the usual comfort zone of good weather. Our tranquil Finnish midsummer sunshine can turn into a nasty autumn storm sooner than you expect. 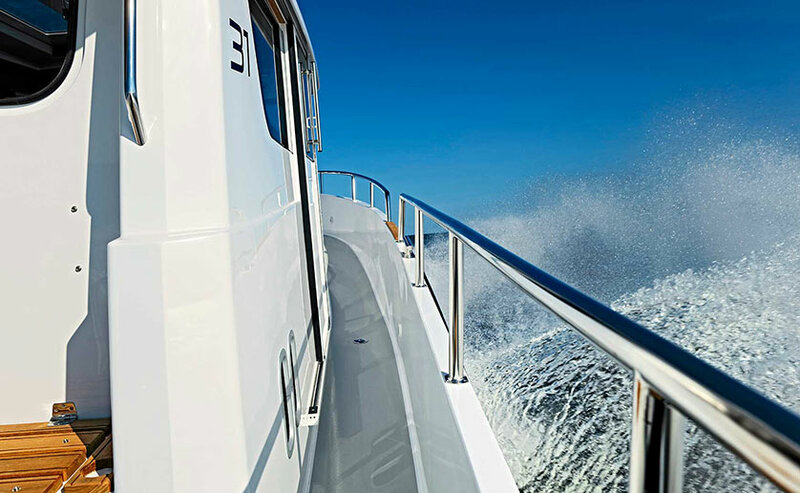 Therefore we have designed and built Sargo’s hull to withstand rough seas wherever you take her. The thickness of the hull and the supporting beams are all designed with safety in mind. A heavy-duty hull keeps the center of weight low enough while ensuring stability and durability. What’s more, Sargo’s tough and hydrodynamic hull is renowned for its very quiet ride, even in rougher seas. Our test crews have spent hours and hours at sea to ensure that our brand lives up to its reputation. For any new Sargo owner and skipper, it is truly comforting to know that your vessel offers more safety margin than you might ever need. Sargo’s capabilities as an all-season vessel have been officially proven as our complete model range (25-36 ft) is internationally certified as B-Offshore. Mr. David Sarin, Head of Production, son of Edy.